Kofi Annan was a team player. How lucky to have been a part of his entourage. I remember the first time I met him. It was in Toronto shortly after he had assumed the position of UN Secretary General. As with so many others who came to know him, I was entranced by his soft-spoken style. And as Deputy Director-General of the International Labour Organization, I was fortunate to have had the opportunity to benefit from his inclusive leadership style. I don’t remember the exact date of my first encounter, but it must have been in 1997, perhaps in the springtime, at an international conference of some sort. I remember, too, that I was on a panel at that same conference, charmingly upstaged by a charismatic woman activist for human rights of indigenous people somewhere in Central America. But I didn’t mind. She was an inspiration. And so was Kofi Annan. Even more so! He spoke with such calm dignity about his vision for all people to be free from hunger, conflict and fear. I was awestruck by his soft charisma – quite a contrast from the activist who had been on my panel earlier in the day – but truly powerful and all-encompassing. Oddly enough, he exhibited this same gracious demeanour the last time I heard him speak, which was only a few months ago at an event in Geneva where he was promoting a report on democracy. From beginning to end, he displayed a remarkable presence and used it to such passionate effect in support of all things noble in this world. 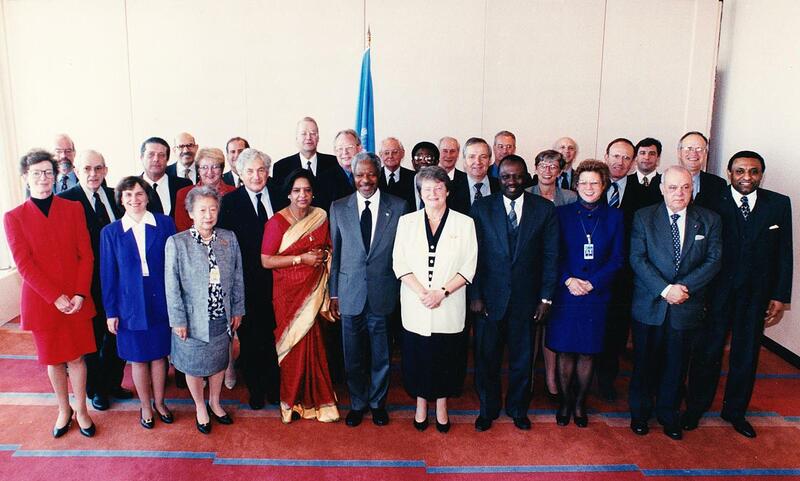 Through my years as Deputy Director-General at the International Labour Organization, I was honoured to be one of his team players within the UN system. I was thrilled that Kofi Annan initiated a significant outreach to non-state actors, both NGOs and the private sector, as he sought to bring new life to the UN system. In many a gathering of the inter-agency Administrative Coordinating Committee where I was often called upon to represent the ILO’s Director-General, I had the opportunity to speak in support of the ILO approach to tripartism (governments setting policy with workers and employers’ representatives) as part of this outreach. Here is a photo of one such gathering. What a treat it was to be there with the S-G and the many other dignitaries from those days – Carol Bellamy at UNICEF, Jim Wolfensohn from the World Bank, Michel Camdessus from the IMF, the High Commissioner for Refugees Sadako Ogata and the High Commissioner for Human Rights Mary Robinson. What was especially appealing, though, was his proposal to open up the UN system to new constituents, including NGOs, business and citizens generally. It was under Kofi Annan’s leadership that the UN attracted the billion-dollar pledge from Ted Turner to establish the UN Foundation in 1997. It was also under Kofi Annan’s leadership that the Bill and Melinda Gates Foundation set the stage in 2002 for the launching of the Global Fund on HIV/AIDS, Malaria and Tuberculosis. And with support from the likes of Professor John Ruggie, Secretary General Annan also launched the UN Global Compact to mobilize business engagement in the UN. This last initiative helped to articulate what eventually became the ten principles for private sector engagement in the UN – of which the four fundamental ILO principles of freedom of association and collective bargaining, non-discrimination, and ending both child labour and forced labour are a part. What was it about this remarkable Ghanaian who rose up within the bureaucratic labyrinth to become the first UN Secretary-General from WITHIN the UN system? I think it was because of his ability to work well with everyone around him and to cajole others through his gentle persuasiveness. And he applied this so effectively with external actors, too. The UN Foundation, the Global Fund and the Global Compact were significant breakthroughs for multi-stakeholder engagement. Even after my own ILO experience, I have deeply appreciated this range of commitments that the Secretary General promoted during his ten years in office at the helm of the UN. We all welcomed this new environment as I was joined by so many others (inspired by this changing environment) to pursue complementary initiatives through both the Council for Multisectoral and Multistakeholder Diplomacy and the Global Social Observatory. Although I will personally remember him for his broadening outreach to new team players, it wasn’t only in this arena that he made a memorable impact. It was also in his dedication to basic human values to end poverty, prevent conflict and promote democracy that we will dearly miss the calm dignity and resolve of Kofi Annan. Kofi Annan was instrumental in overseeing the launching of the Millennium Development Goals as an innovative way of mobilizing development assistance to combat poverty and the launching of the “responsibility to protect” doctrine for humanitarian intervention as a moral and strategic imperative. Both of these are examples of a new approach to global governance under his leadership – one to mobilize the fight against endemic poverty and the other to broaden the rule of law for human rights. Numerous other examples can be cited, to be sure. But in the midst of the post 9/11 mess and invasion of Iraq that complicated his last few years as S-G, these accomplishments stand out as beacons of his unwavering dedication to empowerment of each and every one of us for the ultimate advance of human dignity. Rest in peace, Kofi Annan. Beautiful commentary, insights and descriptions of a marvelous human being. Thanks, Kathy, for writing so eloquently about Kofi Annan.